Have you ever woken up thinking of all the things you have to do, struggled to get your little one to eat some breakfast, turned around to face a huge pile of dirty dishes or laundry, and just felt like throwing your hands up? Yep, you’re overwhelmed, and that’s okay. Everyone feels overwhelmed now and again… especially around the holidays. When you feel overwhelmed there are several things you can do to keep it from ruining your day. One, get organized! Having a birds eye view of everything that you need to do can help you feel like you have things under control. Get organized by making a to do list. Then prioritize your to do list with the most important things that absolutely have to be done at the top… this is where a free printable weekly to do list comes in handy. More on the free printable weekly to do list in a moment. Two, take a moment to do something nice for yourself. For example, try filling out one of these free printable self esteem worksheets, taking a bath or shower with some lavender body scrub, or buying yourself a small luxury such as a coffee or magazine. Okay, back to the free printable weekly to do list. 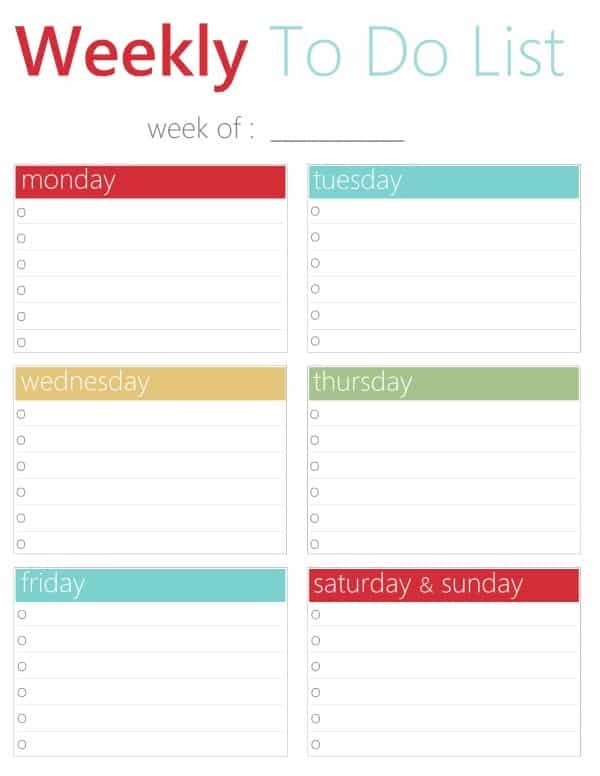 With the free printable weekly to do list, you can easily organize the top things you have to do each day, and manage that feeling of being overwhelmed. How I use the free printable weekly to do list is to actually start with a week’s worth of free printable daily to do lists where I write down everything I have to do each day. Then I take the free printable weekly to do list and write down the top 6 must dos for each day. Once I’m done, I clip or staple the free printable weekly to do list and daily to do lists together and keep them with me. As long as I get through my top 6 items on the printable weekly to do list I feel like my day has been a success! Anything else is extra. Keep in mind, don’t write down tiny, inconsequential things on the printable weekly to do list (ex. check the mail). Instead write the big, important things that must happen (ex. grocery shopping). 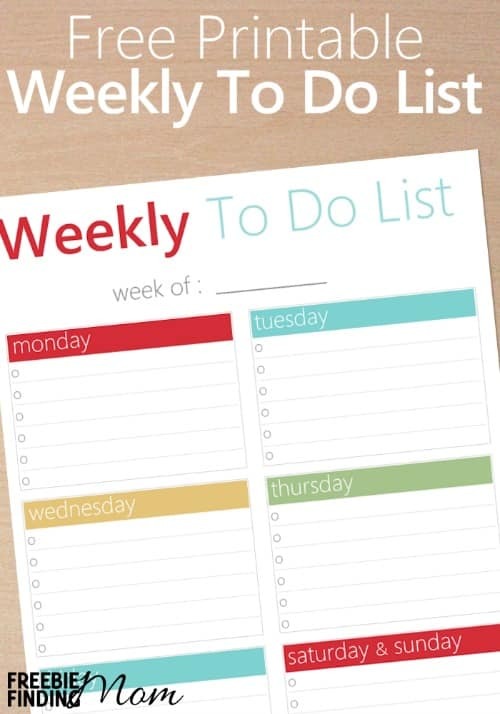 Get started by downloading your Free Printable Weekly To Do List now. When you feel overwhelmed, try the two tips in this article (getting organized with the free printable weekly to do list and doing something nice for yourself) to turn things around. Want more freebies like the free printable weekly to do list? Follow Freebie Finding Mom’s Freebies Pinterest board.